The table was a dull green metal and heavily scuffed. I guess it looked romantic at night time until sunrise with daylight, life’s grand inquisitor, would reveals it’s many embarrassments. Richmond, Vancouver, British Columbia, Canada. On my first night, I sat at the table outside my private entrance, just a few feet to the right of the front door of the main house. My room is on the ground floor. I fetched a wrinkled white linen table cloth and threw it over the table and sat down to bask in the scented night air. The previous two weeks in Seattle were marred with housing difficulties that cast a pall over my plans that made me doubt the worth and efficacy of my trip. I’m not ready to write in detail about what happened (don’t worry, I wasn’t in danger or harm, I think) but I may get around to it when I return to the UK. I drank my tea and went back inside to read another few chapters of Blue Highways by William Least Heat Moon, one of the most sublime travelogues ever written. Least Heat Moon travelled the backgrounds of the US back in the 70’s in a customised van named Ghost Dancing. The book is more than a travelogue. It opens a window to the forgotten communities that still live and sometimes, survive in the small towns whose economic arteries were sutured in the advent of the Freeways. The book is reflective, philosophical, observant yet sensitive without treating the people he met as mere stooges or caricatures. It sets the bar rather high for any travel writer. The house I’m staying in is owned by father and son, Lou and John. Lou is an accomplished painter, recipient of many accolades, subject of several exhibitions. The house is a living gallery to his many works. His wife unfortunately passed away three years ago. She remains the subject of his many recent paintings and her image adorns the hallway wall. She looked a handsome, and like her husband, a cheerful soul. John is thirty eight and is married with a young family and owns his own graphic design business after having worked as a club DJ in Shanghai and as an IT professional in later times – another cheery soul. Lou is in his 80’s and his face is a summer’s playground of smiles and is a very warm witty character. I think I’ll like staying here. It has to be said that despite my room being a little musty, carpets old beyond cleaning and the need for a fresh coat of paint, it is more than adequate for my needs and the people here are friendly and relaxed and that’s all that really matters to a traveller. I have a desk, wifi, an ensuite bathroom which is a boon and a microwave and a kettle for my endless cups of tea. My plan is to be out of the house for much of the day for 5-6 days a week with a day given to the mundane but necessary needs of laundry and replenishing my energies. I write early in the morning and last thing at night. Writing bookends my days. Life occupies the bit in between. It’s vital for a writer to be out on the world. Experience stirs, excites and fires bolts of inspiration into the creative process. We can hide away of course and draw from the after glows of memory but memories, like sunsets, eventually fade beneath the horizon. It was now getting late and my first full day lay ahead like a large box with bows underneath the Christmas tree. I retired early and slept like the dead. This morning I did something I never do voluntarily. I awoke at 5am without a finger of grogginess to torment and tease my soul. Sun beams flooded my room and cool, crisp and clean morning air whispered through my open bedroom window refreshing my lungs. I felt better than I had in weeks. The brightness felt like a special invitation to join the day. I showered and dressed and made a cup of Earl Grey Blue tea in my room before leaving my room for the kitchen. I had a pretty meagre breakfast of bran flakes in a bowl more shallow than the one I’m used to. The flakes floated in a pond of lifeless, grey, thin liquid that had the temerity to pass by the name of ‘milk. I had accidentally purchased a carton off fat free milk the previous night. I sat down to eat my penitential breakfast as quickly as I could, hoping the speed of my spoon would be too quick for my taste buds but those buds are like children, they miss nothing. It’s not my intention to do any adventurous cooking here as I’m out and about most of the day, travelling and taking notes. The kitchen was empty. There are four other guests in the house but I heard not a stir from anyone. I had been up very early but I figured they all must have left the house when I was in the shower. I finished breakfast, cleaned and dried the crockery and cutlery and I left the house around 9am. I felt I little famished and went in search of a nearby diner. I quickly found that there is not much in the way of diners as we know them. Sure, there are many restaurants representing the cuisine of almost every culture in Asia there is but little in the way of heart-attack inducing breakfast emporiums. I walked up and down the local strip mall and found a bakery that had tables and chairs inside. It advertised Panini’s and eggs on the window. It looked a likely candidate. I went in and spoke to the lady who owned it. She told me they didn’t make breakfasts as such but Panini’s filled with egg and Canadian ham. It sounded like a decent breakfast to me. I placed my order, thanked her and took a seat. I noticed her accent wasn’t totally North American. There was a slight British intonation but I couldn’t tell from where. I thought she may have come from the Midlands. Wolverhampton, Birmingham perhaps. I wasn’t sure. Observation-Break: I’ve only been in Vancouver for a few days and so far, I’ve overheard many British accents. The Welsh lady at the bakery, the Lancashire bus driver who drove the 210 bus eastbound from Steveston, the southern English ticket inspector at the City Centre Skytrain station, the Scottish couple I ambling around Gastown, the Dublin guy who has lived here for 30 years who I met at Central Library. Those are only the ones I met and spoke with. There have been many more and I can tell from their demeanour and dress that most of them are not tourists but residents, Canadian citizens even. I do get a sense of Canada’s British heritage when I’m here which make me feel at home in many respects. Spellings are UK English, ‘centre’ is spelled ‘centre’, secondary schools are secondary schools and the Queen frowns from the $50 bank notes with a face of a woman who arrived at the off-licence a minute after closing. The legislature is a Parliament with a House of Commons led by a Prime Minister but the landscaping, the road-signage and architecture are very much American. I have to point out that I have also heard the French language on many occasions. It is a mistake to think that Quebec is the only home to the Francophone community as there are many pockets of French speakers all over Canada, including BC. Teachers go on strike here on points of well founded principle and the British and French sense of societal cohesion is very much present such as the wonderful universal health care system, free at the point of service not unlike the British NHS. There is a flourishing library system that also seems to act as community centres providing free educational workshops on a wide range of useful topics such as social media and IT skills for the elderly and talks/seminars ranging from marketing for self publishers to substance addiction strategies. Canada legalised gay marriage ten years ago. Guess what, the sky hasn’t caved in nor have hetero conservatives been forced into gay marriages against their will either. In British Columbia, there is a policy of open engagement with and treatment off drug addicts as opposed to the lazy policy many other countries employ of just throwing them into prison where they just learn to graduate from user to dealer. This has issues of its own off course but Vancouver and Canada’s heart is in the right place and it makes for a happier, cohesive, liberal and safer society where progressive thinking flourishes. The French/British influence has acted as a positive foundation for the Canadian state and its many immigrant communities have made good lives here in harmony with one another. I’m not saying it’s all a bed of roses however. There are issues of course. Gastown and Victory Square districts are where dozens of homeless heroin addicts loiter, loll and sleep in plain view, occupying a parallel universe to the hordes of holiday makers for whom Gastown is the first port of call (literally). Cruise ships dock only a couple of hundred yards down the road. The addicts look older beyond their years, faces aged, thinned and lined by years of chaotic living and abuse. Many of them look like caricatures of aging rock stars who bypass the middle aged spread like the rest of us mere mortals. Long hair, striking jaw lines and faded tee-shirts and ripped jeans. You would think it was an Aerosmith fan convention until you see the pathetic little piles of makeshift bedding that dot office and storefront doorways. The difference is that their look is distressed from actuality and not the one rich kids get off the peg in Old Navy or Gap. Back the bakery, Chris brought me my breakfast and a cup of coffee. After I finished, some customers arrived in while I took some notes, recording my thoughts, noodling over plot lines for my next novel. After half an hour, I become a little restless and the urge to get moving on with my travel plans for the day took me over like an itch. I left my table and went to the counter to pay for my meal. Chris was speaking to a lady who sat at the table nearest the counter. Chris turned to me and introduced me to her friend. ‘Take a seat, join me’ said Candace. A good looking bespectacled blonde lady with strong features and an intelligent face with a knowing smile sat directly opposite me. I never cease to be taken aback by the openness and friendliness North Americans offer to compete strangers. It can be quite pleasantly disconcerting. Candace went on to tell me about nearby settlements that were off the beaten tourist trail. Steveston, New Westminster, Langley and some more distant ones such as the mountain resort of Whistler and the Native American village of Squamish which is about an hour’s drive from here. She rhymed off a number of restaurants in Steveston. Steveston seemed to be close to her heart. Her list was more than I could hold in my rusting memory banks so I offered her my notebook and pen and she merrily filled two pages of names and addresses. Her husband Jose joined us shortly afterwards. A Filipino by birth, he sat at the next table for his snack. He told me that he and Candace once owned restaurants at various times and were foodies thus explaining their encyclopaedic knowledge of eateries within a twenty five mile radius. Their last restaurant closed due to difficulties with the landlord. Now they work as agents for an insurance firm that specializes in providing cover for legal fees which seem to be universally expensive. Legal insurance is a worthy enterprise and its one we seldom think off. It’s shocking to think how prohibitively expensive it is to access justice when justice is a pillar our free world is supposedly built upon. As well as being an insurance agent, Jose holds down a second job as a carer in a seniors’ home. He seems made for the job. He has a very gentle demeanour and spoke very movingly about the people who live there, many of whom have dementia. I felt very much at ease in his presence, ditto for his wife too. Observation break: funny how in most of the world’s lawmakers are lawyers. What a clever racket. You make lots of vague, labyrinthine laws and then extract high amounts of cash from the feckless and unfortunate to argue about them in court with other lawyers. It’s like a glass maker who goes around the neighbourhood smashing windows and then getting paid to replace them the next day. It’s such a clever arrangement that the cleverness can dazzle many of us, blinding us to the somewhat questionable morality that’s at play. I told him just over a month. They inhaled rather loudly and sat back as if my length of stay was a strong unexpected wind. Observation Break: That was the fifth time I was asked that since my arrival only two days earlier. It’s a question that I’ve don’t remember being asked in any city I’ve visited, even in Madison, WI which I visited in 2008. Vancouver is quite distant from Europe and is quite a distance from other major Canadian cities. It’s a seven hour flight from Ireland to Toronto and then a further five hours to Vancouver. Let me put that in perspective. A five hour flight from London can take you within reach of Moscow, Istanbul and Casablanca. Canada is a vast country with a population only 4 times the population of Ireland and one third that of the UK who mostly live in the cities. I got the impression that Vancouver is not the usual destination for non-Americans which is a shame as its head and shoulders one off the most beautiful cities on earth, nestling in a harbour surrounded by islands, rivers and snow topped mountains, forests teeming with bears, deers, moose, raccoons and an encyclopaedia of birdlife. An Eden if there ever was one. I said I wanted to see the Pacific and since I had never been to Canada before, Vancouver was the obvious choice. I didn’t mention earlier difficulties. I told him that I planned on going downtown and take a ride on the Seabus across the Strait to visit North Vancouver. I also mentioned that I’d be here for over a month. I asked if he was sure. I didn’t want to put them out of their way especially as it looked they were pinching a quick break from a busy work schedule. We drove east along Cambie through the suburban landscape of outsized stucco-fronted houses, neatly trimmed lawns and cookie-cut-out strip malls. The stultifying suburban uniformity was mercifully broken by buildings of incongruous architecture; an English Tudor style hotel with painted stone effect bricks criss-crossed with oak beams, the Nanasker Gurdawa Gurusikh Temple along Westminster Highway (Jose took the scenic route I later discovered for my benefit) and a derelict twin storey concrete building shaped like a capital T with an extra vertical bar running through the middle. It was once a hybrid business that combined a restaurant with reflexology. We continued in this vein for several more miles until eventually we surpassed the reach of the flour and candy stained fingers off the suburbs that slowly surrendered its grip on the landscape to a more pastoral landscape. “Strictly speaking they’re squatters but they’re allowed to live there for free as long as they look after the place” Jose cut in. I nodded in silence, looking out the window. Several men wearing turbans were working in a field. Many Sikhs moved to Canada in the past few decades and many bought farms around here. It was an exotic vision, a stolen glimpse of an authentic Indian pastoral scene right here almost on my doorstep. 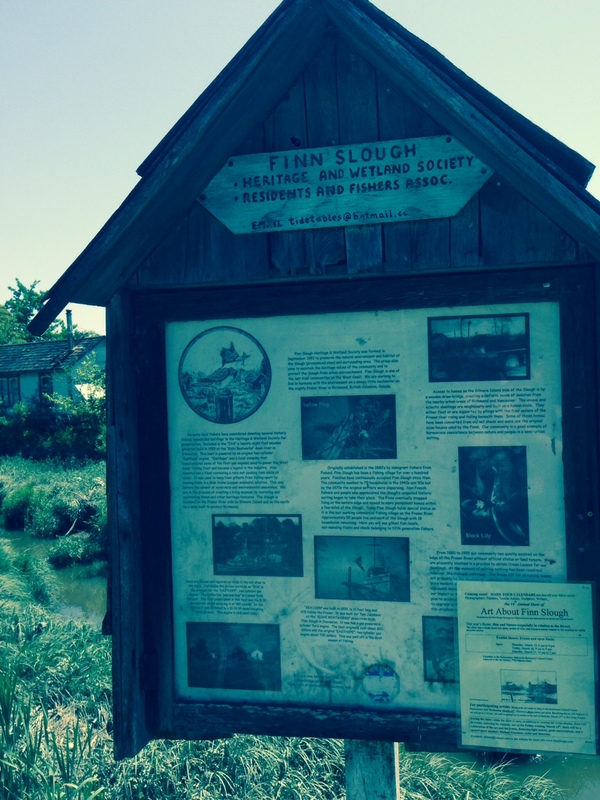 Finn Slough: In the 19th century, a hardy community of Finns founded a fishing community on the banks of the Fraser River. The community thrived and the fishing way of life lasted several generations until eventually, the community withered on the vine of progress and its descendants chose other professions such as IT, law, medicine and perhaps downtown hairdressing for all we know. The clutch of wooden houses they lived in that stood on wooden stilts were abandoned and left to the reclamation of nature. As we know, houses, not unlike nature, abhor a vacuum and a community of artists, painters, sculptors moved in and to this day, the artistic community remains. Artists come and artists go but the ethos has remained the same ever since. Jose pulled up and the three of us got out. The houses were only yards away but we had to cross a wooden foot bridge to get to them. I asked how shaky the bridge was. The word ‘Yet’ hung silently above my head in giant letters like some kind of Banquo at the feast of the conversation. I chose not to speak it aloud. Cynicism even in its mildest forms can give the stranger an air of being difficult. It’s wise to hold one’s counsel sometimes. One can be liked without having to crack jokes. A lesson I’ve learned from experience. We formed a single file as Jose advised. Jose took the lead, I in the middle and Candace behind me. As I walked over the bridge, I felt the planks move and shift beneath my feet. I looked down and saw arresting gaps between the planks. The planks moved and shuffled and slid, albeit a matter of a centimetre or two at each step but when you are used to solid ground, it was a very disconcerting experience not unlike treading on black ice during a brisk walk on a warm summer’s morning. 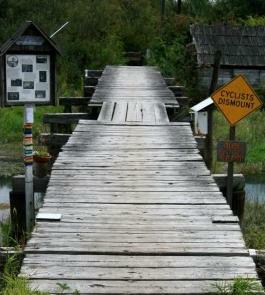 This was a wooden bridge in the purist sense of the expression. There were no metal bracings, no industrial stapling or corsetry of any kind. Just bare planks of wood laid side by side, held up by perpendicular planks at the edges which in turn were held up in the air by wooden struts whose feet were hammered home into the muddy beds below the waters. The wood was not weather protected or sealed in any way. Many planks were black with rot. They reminded me of spent matches that a giant had thrown away. The crossing took only less than a minute but if felt longer for being conscious of every step. I found myself on a narrow path surrounded by tall rushes and reeds. Wooden houses were dotted all over. Some were in a state of dilapidation yet were fully inhabited. Many stood on wooden stilts. 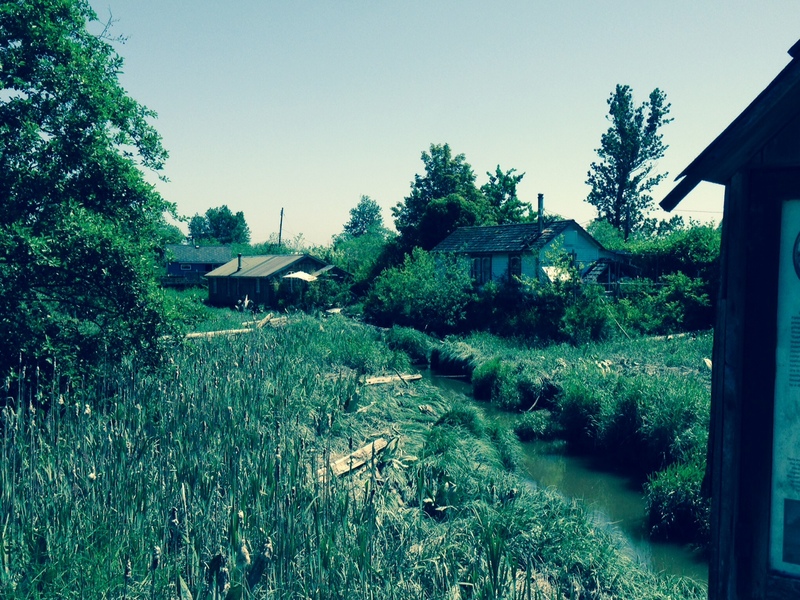 The 2014 remake of Godzilla was filmed on location in these parts and with it brought hordes of flying visitors who also made the discovery of Finn Slough as I did. The artists were not that amused by legions of visitors gawping at them and their homes as if their purpose in life was to be an interesting sideshow at a zoo. The visitors I am sure meant well, who can blame a person for curiosity but the traveller must be aware that the people, communities and buildings he/she encounters do not solely exist for the benefit of an interesting photograph or journal. It is right that they are depicted and recorded but in a way that magnifies their essence within the prism of truth and not exploitation in any shape of form. When the circus left town, the artists for the first time in their community’s history, put up fences and gate along the paths that passed by the fronts of their hours, blocking the path of visitors. This was to preserve their privacy. I couldn’t say I blame them but it did seem like an Achilles ’ heel of a reaction as they did sell a lot of their work to the very people who once passed by their homes and who now, crane their necks and peer longingly over the wooden spirits of no pasaran. We didn’t see anyone around. All was still save for the burbling of the river and the sounds of rushes brushing against one another. We went back the way came. There was no other way, back again across the wooden bridge of potential doom and back to the car. I promised myself that I would return. 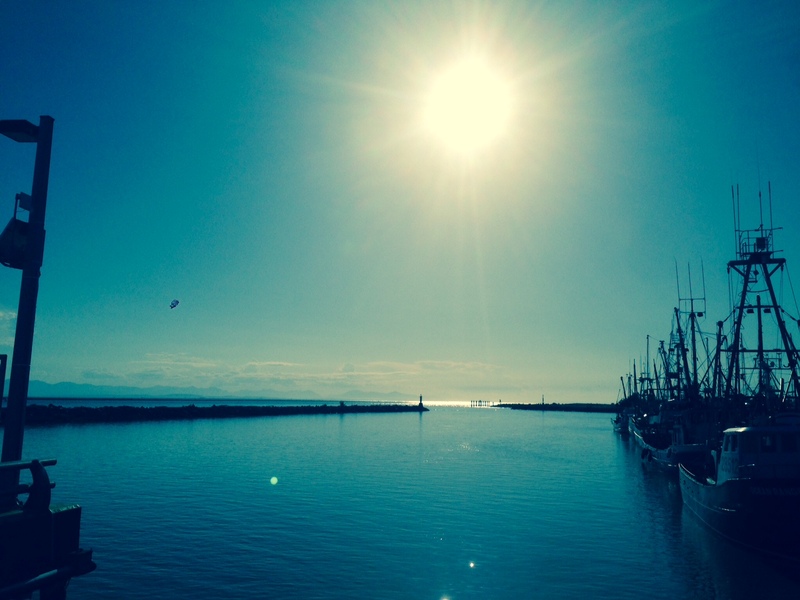 Then we went to Steveston, an outpost of paradise. Frankson Says Seattle : Essay on Writing Full-Time in the US and Why America..
It’s been a while since I last wrote a blog entry and I often wondered when I would get around to writing the next one but here I am. At long last, after many years of planning and talking about it, my 6 month sabbatical (or ‘furlough’ as it’s more known as in North America) is upon me. I plan to write my next novel and market as best I can, the stories and novels I have written to date, within the world of social media. If costs allow, I may even pay for several copies to be printed to send off for review and even impromptu yard-sales/car-boot sales to set a foundation stone in the real world. For many months, even years, I have been so busy at work that my creative juices evaporated in the searing heat of pressure and fatigue. This concerned me as writing is a passion of mine but I have to earn a crust in my day job. I saw no end to the maelstrom if I kept on the way I was and I knew something had to give but in a controlled responsible manner. So I switched off the engine and let myself glide to the ground and this week, my first week of my freedom, I watch the propellers slowly whirr to a silent standstill while I decompress , step from the cockpit and fill my lungs with new air. During my time, I plan an extended stay in Seattle or Vancouver and right now, a number of options are on the table and my dousing pendulum swings towards Seattle. I can’t say much at this moment about the possible house I may end up in but serendipity is a wonderful thing. I let this be my guide. Firstly, one can become overly familiar with a city to the point where the fascinating becomes mundane and the incongruous can just become just another tree in heavily thicketed forest. Secondly, my writing and love of literature is heavily rooted in Americana. To paraphrase and to extend Orwell (daring and forward of me I know), when one is on a sinking ship, all one can think about is a sinking ship and therefore sinking ships soak into every nook and cranny of one’s writing. Not that London is a sinking ship but it’s the metaphor Orwell used and I completely see his point. I have visited Chicago many times on business and have had ample free time to explore it and enjoy road trips upstate and into Wisconsin. I feasted on the flora of the small towns, the expansiveness of the landscape, the long endless lonely roads, horizons kissed by cornfields, random homesteads, motels, abandoned buildings, and last but not least, hospitable and individualistic people. Geographically, America is a very large country that ironically, resembles the properties of the tiny atom. Several specks of very busy protons such as New York, San Francisco, LA, Miami and Chicago that whizz and whirr with their millions of busy people but the space between them is vast, empty. The spirit of the road movie is freedom. There are different categories (fleeing a bad situation to find a better life, fleeing from the law or the underworld) but what makes these movies plausible in a way that is difficult to do elsewhere is that America is a country where you can simply disappear and pop-up somewhere else and reinvent yourself. Whether or not this reflects the modern day of cellular and internet connectivity is another story but today, these stories occupy the domain of the realistic. In a highly populated country such as England, it is very hard to imagine disappearing from Cornwall and starting all over again in Newcastle with an adventure up the M1 in between without a significant possibility of running into someone who may know you or at least has heard of you. The UK is still a highly centralized country in terms of its media. From the remote Scilly Isles to Edinburgh, everyone watches the same news channels, read the same newspapers. In the US, the national papers and TV channels do exist but they are weaker glue. What we in Europe often fail to realise is the sheer size of the US and even Canada too. America is not the size of France nor is its states equivalent to British counties. Self-Reliance – unlike Europe, a town in the mid West could be 100 miles from the next one. Think about how this would have affected the townsfolk/famer mindset in the days before the telegraph and the telephone never mind before the advent of GPS, Google and smart-phones. You couldn’t have ridden to the nearest neighbouring village nor return within an hour in case of emergency. The early settlements resembled the lunar bases we often see in science fiction movies where everyone wears tinfoil suits and the men still wear bryl-cream on their head, except that they had breathable air. Its people had to fend for themselves often struggling to survive in lawless and inhospitable conditions. It was a land of immigrants who had escaped the tyrannies of poverty, war and persecution in the Old World. The New World was a chance to form a society in the image of their dreams. It’s a matter of debate as to how well this turned out and is beyond the scope of this essay but such newly formed societies had to employ wanderlust, faith, hope and self-reliance, not just individually but within their communities too. A by-product of this was an unconscious sense of temporiness. Unlike the Old World with its solid stone castles and cathedrals that seem to have been around since the dawn of time itself, the American settlers faced a land with so such constructs. They were no longer in a land where they could use the scaffolding of history to lean against be it law or edifice. Is it any wonder that many of these communities turned to their Gods in their many, sometimes perennial times of need. No matter how strong we think we are, we all need an anchor of some kind. From these roots grew the modern day America we know either through first-hand experience or through the prism of movies and literature. The hero of the road-movie is a lone pilgrim, leaving his/her old life behind to venture into unknown land and people to build or find a new life with highs and lows, a trail of trials, tribulations and dawns and false dawns along the way until they either reach the promised land or die. The road movie is the subconscious re-enactment of the history of the American soul. Localism – Some Europeans comment on how parochial American news report seem to them. Its news networks often ignore large swathes of the outside world. Howevre, it is wrong headed for an outsider to poke fun at this is and merely shows a lack of understanding of why this maybe. It’s easy for a European to be (or pretend to be in some cases) cosmopolitan when there are thirty or so nations within a 3 hour flight radius. In Belgium, one can reach no fewer than 4 nations within a radius of one hour’s drive. America occupies a land mass similar to that of the entirety of Western Europe. Driving from LA to Boson is equivalent to driving from Lisbon, Portugal to Vilnius, Lithuania. In the former trip you remain inside one nation state; within the latter, well I don’t have enough fingers and toes to count them but you get the picture. The nation state of America as I mentioned earlier, is a much weaker construct than we Europeans are used to for reasons I’ve touched upon above. America was not founded all at once by one set of pilgrims or immigrants but by waves of very different groups who arrived at different times. Each moved across the continent at different speeds and in different directions during a time when long distance communications were very difficult or an impossibility. These groups eventually settled and those which survived, established permanent communities that formed proto-States that still spoke the settler’s European tongue. Minnesota was largely Swedish, Pennsylvania largely German. The Federal government did not have a long reach and even then, was like a radio signal that was bedevilled with the static of the nation’s size, space and distance. Wariness of Government: Mistrust is perhaps too strong a word. Perhaps it’s better to say that the most Americans have always stood their arms defensively folded, casting a healthily wry eye at Washington, sometimes with a gun tucked under the belt. European nations are much smaller, compact and homogenous and thus easier to manage. All modern European nations at one time or other had a King or Queen who was seen as the Father/Mother, grand protector of the nation. Many nations have since become democracies but the legacy of expecting central Government to help one out of a tricky situation has persisted to this day. Such a legacy never existed in America which goes a long way to explain why many Americans, including its poorest, are both suspicious of central Government and have an aversion towards receiving help from it. Europeans are often bewildered at the abuse and bile levied at President Obama for his attempts to extend free access to medical care. In Europe, free medical care is seen as the 11th Commandment, an immutable aspect of nature itself but again, the roots of attitude, like a person, stem from its childhood and formative experiences. For an American to think like a European or vice versa, each would have had to have had the history of the other behind it. These aspects of the American attitude towards Government often perplex the more communitarian minded European but it is good to remind one’s self that nations in many ways are like people; our personalities are formed through nature and nurture and it’s only a fool or a despot who expects one’s neighbour to be a carbon copy of him/herself. So which is better, the American or the European way? I shall sit on the fence on this one as both have their advantages and disadvantages which are well documented. I am merely trying to attempt to explain the differences as best I can and I see them. When we explore the reasons behind the why, then we begin to nip the bitter buds of xenophobia, racism and jingoism. Only then we realise that no nation has the right to point the finger at the other and say ‘Don’t do it like that, let me in and I’ll show you how it’s done’ but I do believe that the exception should be in cases where people are being systemically and physically harmed by tin-pot dictators. In such cases, humanitarian intervention is justified but I am sure this is a matter of debate and again beyond the scope of this essay. So back to my decision to move to North America to write. I have a deep and long lasting appreciation of American writing both factual and fiction. Fitzgerald for his languid language and exposition of character and beautifully crafted and controlled narrative documenting the ascent, disillusionment and decline of one man’s wish to pursue the American Dream. Hemingway for his muscular, sinewy yet insightful prose. Steinbeck for his exposition of the truth. My particular favourite is ‘Travels with Charley’, a travelogue about his camper-van road trip through rural America. Every sentence a pure joy of description and insight into the human condition. Hunter S Thompson for his single handed invention of the literary style of Gonzo Journalism. His literary documentary ‘Fear and Loathing on the Campaign Trail’ is an acidic, accurate, warts and all depiction of both the minutiae and the broad strokes of the 1972 Democratic Party Presidential Candidate nomination process that reads like the political equivalent of watching sausages being made. Unpleasant but peculiarly intriguing. Cornell Woolrich for his dark tales of how life can turn into roads of despair at the turn of seemingly innocuous events. Chilling in their realism and makes one do a double-take of the paths and decisions taken in one’s own life. Michael Connolly for his Harry Bosch detective stories where LA is a character in its own right, weaving its anxious fabric through the fabric of narrative. Frank Bill and his modern day classic ‘The Crimes of Southern Indiana’, a collection of connected short stories. A writhing, unsettling slab of beautifully and realistically written American Literary Gothic. No angels here and reader may fear to tread. Willie Vlautin for his plain-style tales of everyday blue collar America. The humour and the struggle of the Everyman/Everywoman is sympathetically depicted without ever retreating into the easy burrows of pity and cliché. Each of the characters is a fighter. Whether or not they win is another story but it’s hard not to empathise with even the worst of them as Vlautin’s characterisation teaches us that we all have had a road to travel, some more rocky than others. Show me your nice polished shoes and I’ll show you the smooth, well tarmacced road you just walked down. Humanity runs through his narrative landscape at every turn. I could continue but I think I’ve made my point. It’s these authors and more who have whetted my literary appetite. I hope that living in the land they still roam, either in body or spirit, may help sculpt the shape of my own writing to come.